Pleased to announce that the Vancouver Letterpress League calendar is almost ready! Members are collaborating on a 2014 letterpress calendar. It will feature 12 original prints by a different artist, one for each month. 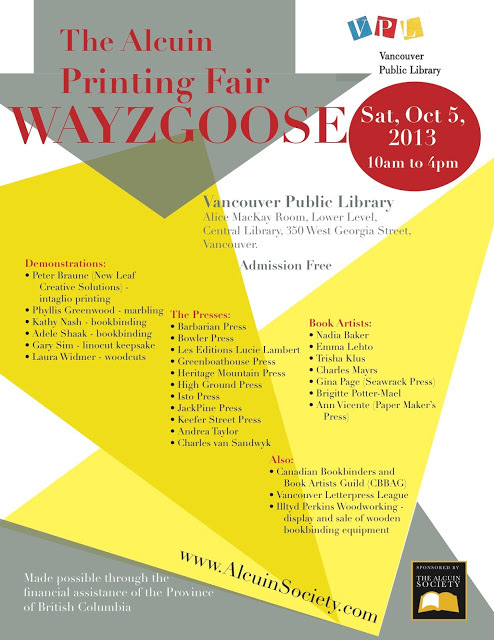 The calendar will be ready for the upcoming Wayzgoose printing fair on October 5th, 2013. The Letterpress League will have a table and we’re looking forward to meeting new faces and people interested in book arts, letterpress, and printing (and especially if you have a press in a garage or other odd place). The next regular VLL meetup will be after the Wayzgoose, but in the meantime swing by the table and say hi. A Wayzgoose is a very old printing tradition, where the owner of the press would host a dinner or feast for the people who worked for him. The traditions nowadays vary – from steamroller printing in Seattle – to the demonstrations and tables at our own Vancouver Public Library.